Everyone knows Mizuno Golf’s reputation for making top performing models in every iron category from professional level to game improvement. What many golfers don’t realize is back in the 2007 their MP-600 driver was the first to have sliding weights in a channel at the rear of the sole to help compensate for a player’s slice or hook. Called the “Fast Track” system, this idea is joined in the JPX-850 model driver with two weight ports in the sole plus a hosel adjustable to eight loft settings. What this all translates into is a lot of control over spin rate, trajectory and fade/draw tendencies and it’s done with a different approach. First of all the sliding weight channel in the JPX-850 is from front to back rather than heel to toe as done by competing club makers. Therefore the closer the weight or weights (there are two of 8-grams each) are placed to the front, the lower the spin produced but also the weights can be used in one of two ports (near the heel and toe) to adjust for draw/fade bias. Add to this huge range of adjustments these features provide, the hosel lofts from 7.5 to 11.5 degrees so most every player can find a set of settings to help them hit it longer and straighter. And there’s another difference worth mentioning. 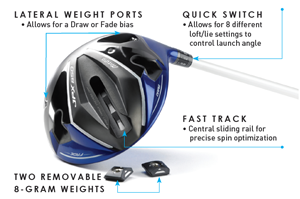 The JPX-850 head does not have, like with many other drivers, a sole channel parallel to the face, opting rather to make a crown with added flexibility to give more rebound at impact. So having familiarized myself with all this I took mine it to a loca l golf shop for a session on their launch monitor. We settled on 10.5 degrees loft with one weight in the toe position to compensate for my tendency to hook and the second at the front position of the channel to lower the spin rate. It’s worth pointing out you have to do this to find settings for maximizing distance and trajectory for any adjustable driver but it is especially important for one with as many options as the JPX-850. On the course, the combination of these settings with the Fujikura Motore Speeder shaft produced a medium ball flight—just about what I can expect with my 95 mph swing speed that on a good day might even approach 100. Distance was slightly better than all but two of the other drivers in this year’s crop—a no-wind carry of about 230 yards with run out of course depending on the turf conditions. Sound at impact was consistent from sweet spot hits to slight misses and when I happen to catch it a lot towards the toe the feel still was solid. Playing the JPX-850 for 10 rounds leaves no doubt this is a low spin driver so those with swing speeds south of 85 mph will have to adjust the loft to the higher end of the range available and probably go with no weights in the Fast Track channel. Negatives: Though at $400 the JPX-850 is not the most expensive fully adjustable driver on the market the price is high enough some extensive testing prior to purchase is smart. The clubhead is 440cc or some 20cc smaller than many drivers but this did not seem to compromise the forgiveness typical of the larger size. Also and this may make a difference to some, the only color you can buy is a vivid blue that Mizuno seems to like. 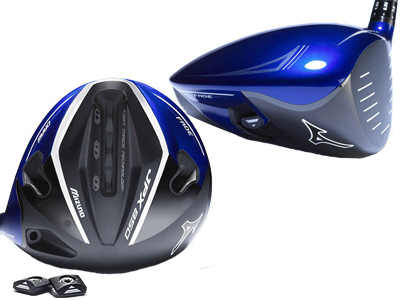 Recommendation: The JPX-850 puts Mizuno back the game as far as drivers are concerned and I really liked it—certainly on my short list of best 2015 models.